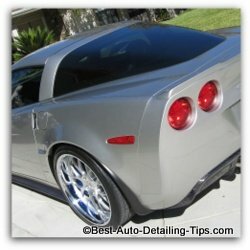 Auto paint detailing tips to make you the envy of the neighborhood! Tips of success counter to convention! Auto paint detailing is not only the single biggest concern, but the most talked about and highly debated area of surface car care among car owners and car enthusiasts alike! Any trip down the car care aisle at your local retail store will make your eyes roll back in your head from anxiety! So many voices all screaming for your hard earned dollars! Follow along as I provide many dedicated pages that will help you understand and make decisions based from a more informed position that comes from my decades of professional detailing experience. Advances in chemical engineering and manufacturing have made our world both dramatically better and easier when it comes to car paint detailing. From car waxes to car polishes, advances in technology have not only provided us with products that produce superior results, but do so in a way that is easier than ever. Now first-timers can achieve dramatic results with basic products that were originally only possible from veteran detailers with years of experience. But like the proverbial theme of human nature, old habits die hard, and many people remain ignorant to the wonderful products these technological advances have brought us! Why should you know what clear coat is and why you should even care. A topic full of bad information, follow this Q. and A. session to learn the important role clear coat plays with your car paint. Keep your new car looking like a new car for 10 years and 200K miles. Tips to get the results you want. Darren shows you the simplest way for a spot free car washing experience. Just What is the Best Color of Paint? Choosing the next color of car may not be as easy as you think. Learn what the Expert has to teach you that could make or break your world of car ownership! Is there a difference between sealant and wax? Do you know what you are really shopping for? Learn the difference most people don't understand! Looking for a solution you can do yourself when it comes to restoring the health and beauty of your cars paint finish. Learn some professional tips of proper care for your cars paint before restoration is needed. A popular product that comes in two levels of aggressive rubbing compound formulations. See if this is the wining combination for you. Chip repair, Scratch Removal, Etc. See why Darren thinks every car owner should have some of this versatile scratch remover. Eventually you will be faced with a scratch on your paint and you will go looking for help! Now you have found it! Most people underestimate the beauty and value that comes from little efforts that make big differences. See the better alternative when it comes to car paint chip repair. Can anyone say road rash! This unsightly result of much freeway driving can be a real eyesore to the overall look and beauty of your car, see the better alternative straight from the Expert that promises to raise your auto paint detailing results!